Finally, the two ingenious innovators decided to meet and make their dream of an affordable, open-source prosthetic hand a reality. In early January 2013, Van As and Owen announced that they were putting the finishing touches on their finger-replacement design. Thanks to generous donations from the internet community and MakerBot, they decided young Liam would receive the first 3D printed hand prosthesis. 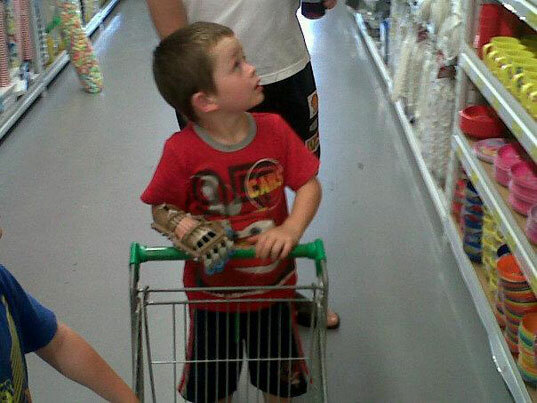 It only took a couple of days for the young boy to adjust to his new Robohand, as evidenced in the video above. Within a week, Liam was able to use his new fingers to do everything a human hand can do, including throwing balls and picking up coins. But this heartwarming story doesn’t end with Liam. Van As and Owen have made their design, which has the potential to help thousands of people, available for free on the internet. “Our vision is to make this available for people and locations where there’s no infrastructure present,” Owen told NBC News. Using lightweight materials and a 3D printer, anyone can create their own Robohand for less than $150… a far cry from the $10,000 Van As was quoted at the time of his accident. The Robohand design is now available for free on Thingiverse. For more information about the the project’s progress and how you can support it, visit the designer’s website.